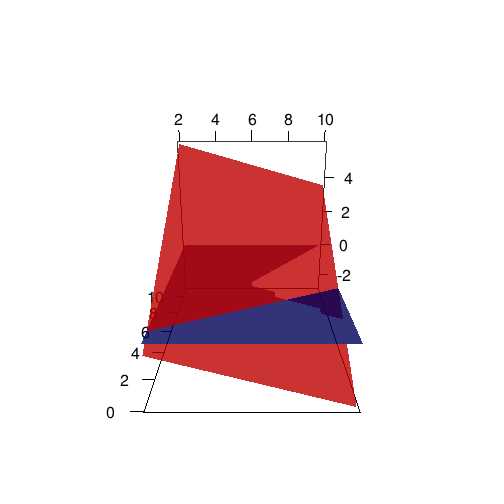 In this example we demonstrate how to solve the following problem using the RcppGSL package. GSL is the GNU scientific library and has many useful functions written in C++. RcppGSL is the Rcpp interface for R. Please look at the separate chapter "how to install RcppGSL" as that needs a trick or two. We have a two-period problem of a consumer who has a cake of size $ a $ and needs to decide how much to consume today and how much to leave for tomorrow. The choice of how much to save, $ x $ , is a continuous variable; The size of the cake today is continuous as well, but we measure it only a set of discrete points. If we are interested at the value of having a cake size of, say, $ a = 2.7 $, we can use an interpolation technique to compute this value. This is very simple problem. To add at least some realism, we will linearly interpolate the "future value" $ log(x) $. This should mimic a more realistic situation when our model does not admit a closed form of this object. which implies that savings \(x\) are a constant fraction of current assets. In this approach we want to choose \(x\) to directly maximize $ (a - x) + log(x) $ . We will use the inline package to write C source code inline. Then we compile the source in place to a C function, and we call it from R. See chapter "intro to Rcpp". It is useful to get familiar with the funcionality of the GSL library first. Please have a look around the manual of GSL relating to one-dimensional minization. In particular the setting up of the various objects can be a bit confusing initially. We are basically presenting a modified version of the example shown on that page. // minimizes a function. we multiply return values with -1 to fix that. res1[res1==1e9] = NA  # the value 1e9 stands for "not feasible"
Now that we are more or less convinced that the objective returns sensible values, we can setup the optimizer. 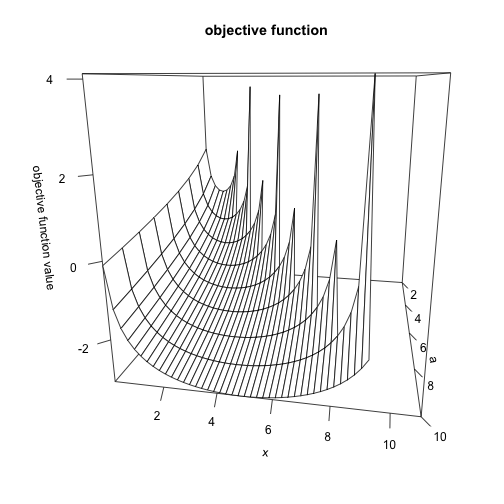 In terms of the above picture, for every value of a on the right axis, we want to pick different values of x and find the one that makes the objective function smallest. // create an fminimizer object of type "brent"
How far is our solution from the closed form? We again test our objective function. 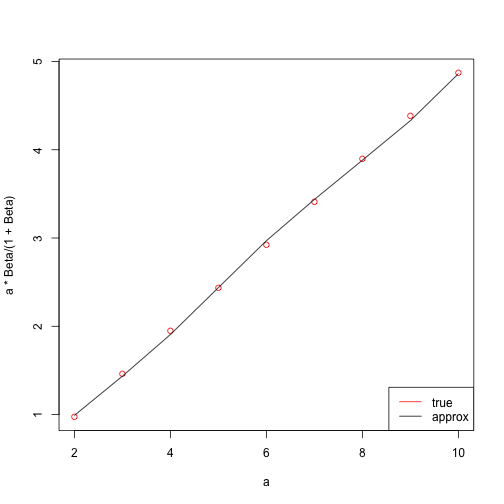 We can make a nice plot with the rgl package. Notice that the objective (red) crosses the value of zero (the blue plane) at every state. This is important, since it tells us that at every state there exists a solution to this problem. ##### How far is our solution from the closed form? You can see that in this instance the second approach clearly outperforms the first one. 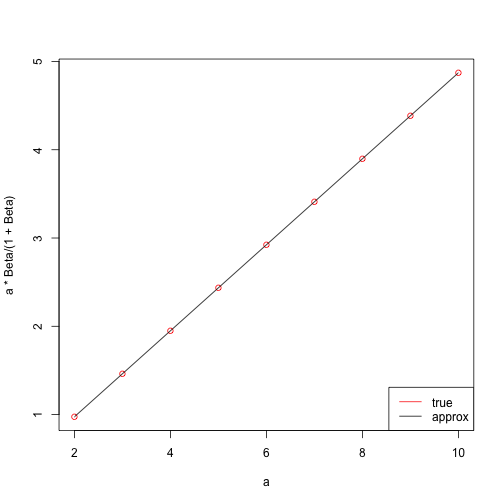 This is quite obvious, given the simple function we had to solve.